My Apothecary Chest: in 1994, it arrived via container to California from Hong Kong, where I discovered beading during an ex-pat assignment there. Serves as the repository for my beads. Handcrafted. It has 52 Drawers. Having lived in Asia for a year and a half, I enjoyed using bone beads and buying beautifully carved bone centerpieces. 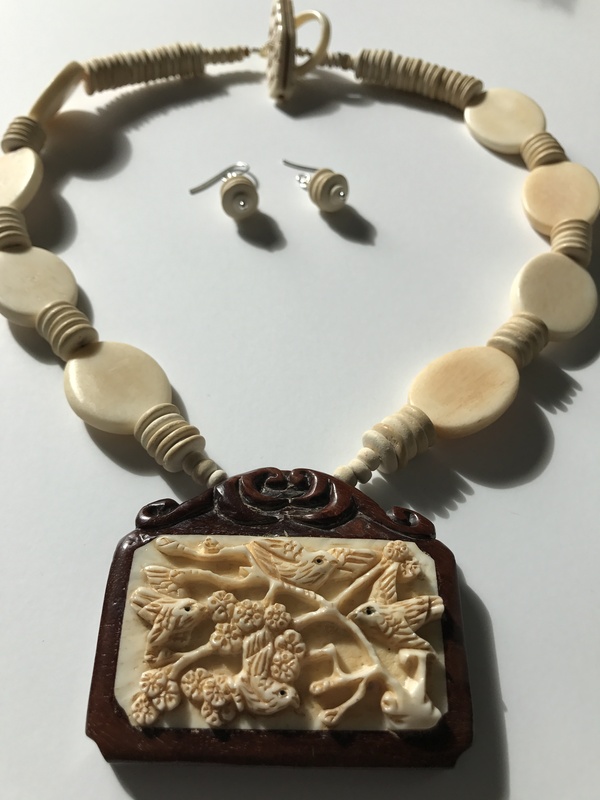 Bone beads are popular all over the world and come from organic antlers or horns from animals such as oxen, cows, camels, and water buffalo who died naturally. In Hong Kong, I found three variations of bone beads: natural white, tea-dyed, and otherwise dyed. Later on, visiting my husband’s son and his family in Bozeman, MT, I bought some beads made from deer hooves which looked like a dark wood. This drawer features natural white oval beads and spacer beads. The clasp is a bone ring and a toggle charmingly “painted” brown which I thought spoke to the centerpiece. The centerpiece is 2” x 2.5” with a lovingly carved scene of birds in leafy tree branches. It is inlaid into a piece of rosewood, also well-carved. Turn it over and the artist, proud of his work, embedded his signature in a perfect circle. This is the only Chinese carving intended for jewelry I have ever seen signed. The Chinese started carving bone in the 5th century BCE for use as tools. Attracted to its natural beauty, they evolved their carvings to adornment. The necklace is 18” long plus 2” for the centerpiece. Earrings included. $75. I intuitively named this necklace “Picaresque.” Upon thinking of the meaning as rogue or bohemian, it is really appropriate. This necklace is all about the centerpiece; I made it in a class in the 90’s, wore it in the bohemian era on a cord, and put it aside. Recycled, reused and re-invented, it is happy now with yellow jade beads tying the centerpiece to the necklace. Only after living in Hong Kong and becoming a regular at the Jade Market did I realize how many colors of jade there are! This strand is a honey mustard shade, interspersed with the same ethnic beads as the centerpiece. It is finished with a gold metal clasp. Let me describe the delicious beads featured in the centerpiece: The most roguish are the two irregular rounds of ram’s horn—the first and only time I had a chance to buy ram’s horn; from Morocco’s Atlas Mountains as I recall. My next favorite beads are the jasper and yellow striped beads. 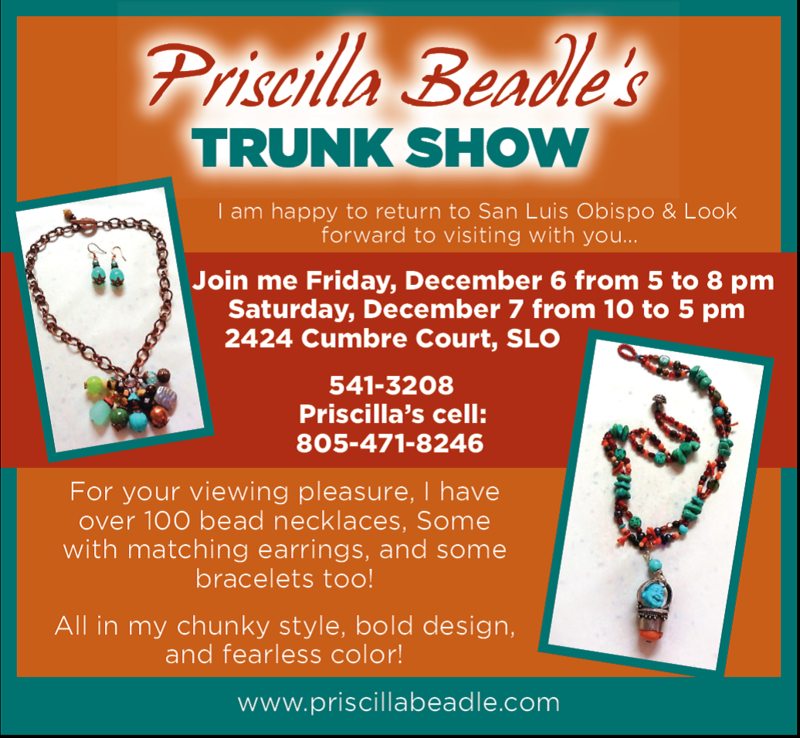 They are trade beads from Mozambique that I bought in a Lisbon, Portugal flea market in 1965…long before beading was a word that had even drifted through my mind! You’ll also notice a conical wood bead in the same honey mustard shade, two ethnic jasper beads of unknown provenance, green sand-cast glass African beads, and glass jasper spacers. The framework for the centerpiece is brass wire. The necklace measures 22” with the centerpiece 3” wide by 3 ½” long. The price is $215 including shipping. Titled, “Social Success”, this creation joins Murano glass beads with six 1960’s vintage Lucite beads. The clasp is dyed and carved from sustainable water buffalo horn with a toggle I made from sterling silver wire. The necklace is 20″ and is accompanied by Murano glass asymmetrical earrings of one square silver foil glass bead and one twisted bead tied together with black seed beads. The larger bead, a tad over 1″, hangs 2″ from the ear piercing. The square bead earring is 1.75″ long. The set is priced at $148 including shipping costs. I took a baby step this summer and designed a very small Murano pendant (see previous posting) from my new acquisitions. 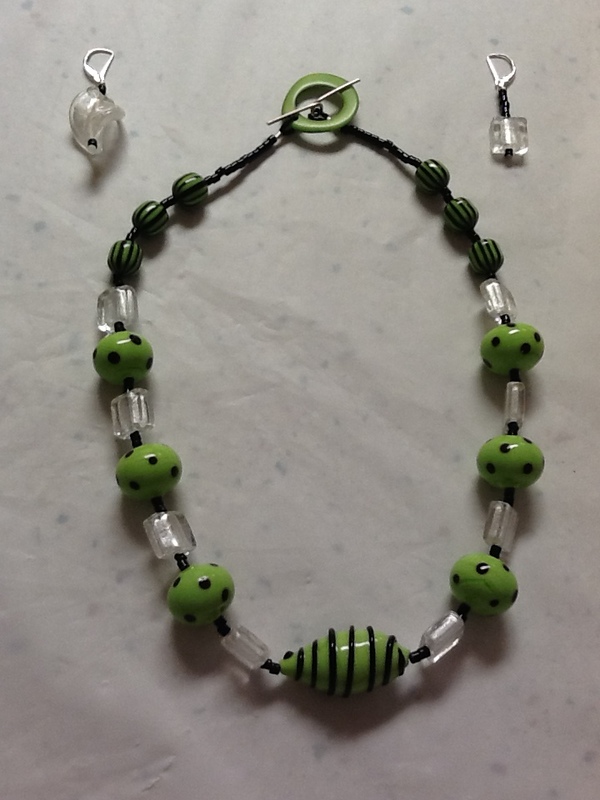 Now taking another step with this lively necklace in lime and clear/silver foil-lined glass beads from Murano. This winter: some real adult steps working with the big boisterous boys; stay tuned! I usually start designing in my imagination as I am buying beads and this purchase was no different, except for one big thing: they were going to be two separate necklaces. But the beads bonded in my suitcase during the rest of my Italian journey and emerged as one necklace with black seed beads to make the lime and clear colors pop. The necklace was a bit short so I searched for appropriate companions to join the Murano glass and found just six of these 1960’s vintage Lucite (fancy for plastic). Serendipity! Ditto for the clasp: dyed horn carved from sustainable water buffalo horns and a toggle I made from sterling silver wire. The necklace is 20″ and is accompanied by asymmetrical earrings in silver foil glass beads, also from Murano. Asymmetrical, in this case, means I had one square bead and one twisted bead tied together with black seed beads. The larger bead is a tad over 1″ and the earring hangs 2″ from the ear-piercing. The square bead earring is 1.75″ in length. The set is priced at $148 and includes mailing and shipping costs. I have titled this creation “Social Success”. Considered to be the source of unconditional love, Guanyin, the Buddhist Goddess of Mercy, is the most honored Bodhisattva in Asia. 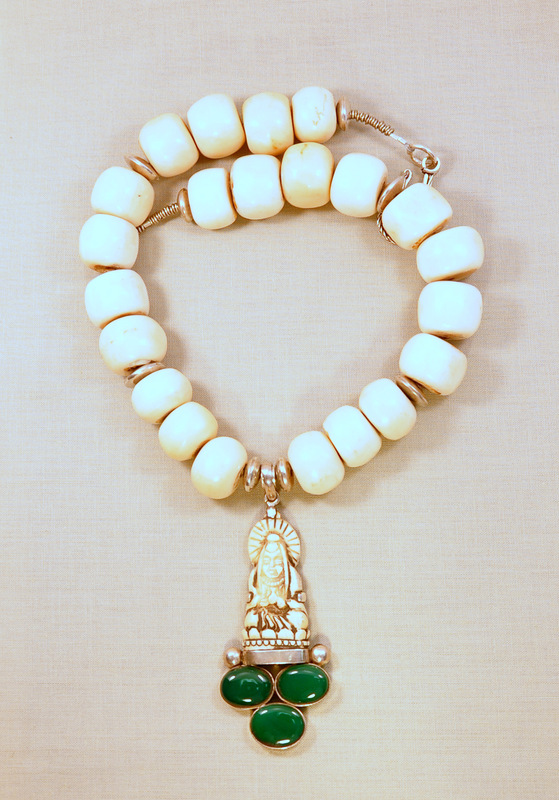 Guanyin is often depicted in white and usually wears a necklace since she is considered Chinese royalty. She is always a creative inspiration to me. In this centerpiece, a beautifully carved bone goddess with a bezel of sterling silver is enthroned on sterling silver and green agate. This figure is nicely finished on the back which in my mind shows the artisan’s reverence towards Guanyin. 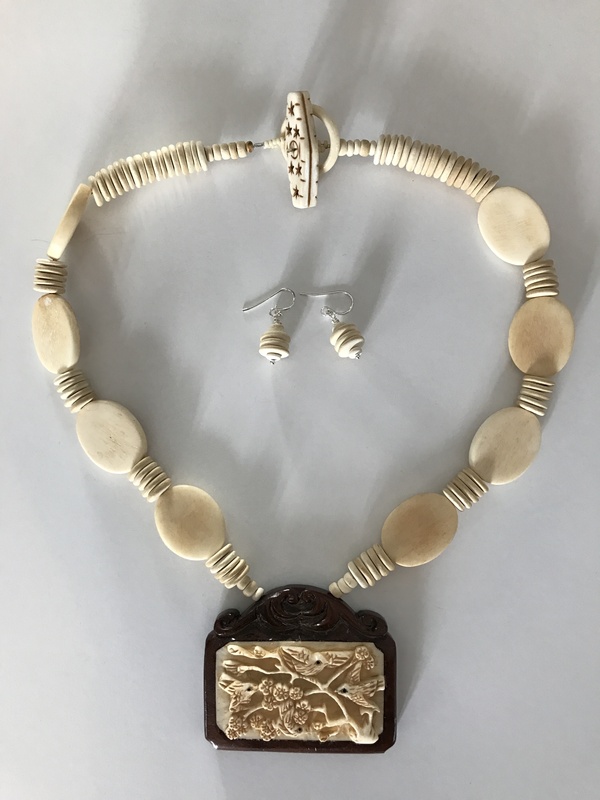 The necklace is made with large rounded beads of white coral which measure about ¾” high by almost 1” wide; it is a true chunky Beadleful work. There are sterling silver discs interspersed with the coral. It is finished with small silver hichi and a sterling silver clasp made in Bali. This one-of-a-kind necklace measures 21” and the centerpiece is three and one half inches long. The necklace is priced at $159 and includes standard shipping.